Smart » Roger Perron Inc. 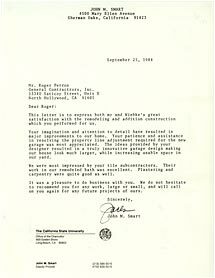 This letter is to express both my and Wiebke’s great satisfaction with the remodeling and addition construction which you performed for us. Your imagination and attention to detail have resulted in major improvements to our home. Your patience and assistance in resolving the property line adjustment required for the new garage was most appreciated. The ideas provided by your designer resulted in a truly innovative garage design, making our house look much larger while increasing usable space in our yard. We were most impressed by your tile subcontractors. Their work in our remodeled bath was excellent. Plastering and carpentry were quite good as well. It was a pleasure to do business with you. We do not hesitate to recommend you for any work, large or small, and will call on you again for any future projects of ours.